The Mississippi river and all its tributaries cover approximately an eighth of American continent, and has its tendrils in 31 states, as well as a couple of Canadian provinces. Father of Waters, mother of legends--the Mississippi River collects tall tales and myths as it moves through the land, in about the same way it collects the waters from its tributaries. People sing about it, dream over it and write stories about the grand old river, treating it with awe, affection and sometimes a little fear. As it's the largest North American river, there is no one state that owns it, nor one type of people that consider it a source of life or beauty. With so much rich and factual Mississippi River history, there is no reason for storytellers to make up tales about it--but that's never stopped anyone. The Mississippi is so associated with the U.S. South in some minds, it can be a surprise to find out it starts its journey in Minnesota, in Lake Itasca. The river is smaller and shallower here, sometimes as little as three feet deep. As it snakes its way through the interior, the Mississippi meets up with, and draws from, two other great rivers--the Missouri and the Ohio. Their combined strength creates a powerful force that rolls through to the Gulf of Mexico and the Louisiana Delta, along the way achieving depths of 200 feet. The main river and all its tributaries cover approximately an eighth of American continent, and has its tendrils in 31 states, as well as a couple of Canadian provinces. The vastness of the Mississippi River make it easy to see why the Anishinabe people reportedly called it "Messipi" - Father of Waters. And, though they didn't know it at the time, provided school children everywhere with one of their favorite words to chant and spell. The waters of the Mississippi River acted a roadway for the Native American tribes that dotted the land by its shores. With a canoe or raft, and a steering pole, people traveled all along the water way, trading, gathering supplies, or moving entire communities from one place to another. The river was full of fish and other water creatures for sustenance, and the river land was deep and rich, providing ground nutrients to agricultural crops. The Europeans arrived on the river in the early 1500s, with an exploration group led by the Spaniard Fernando De Soto. They were looking for plunder and exploitation of the tribes, but what they got was a surprise. At some point it must have seemed to them as if the very river itself was against them. The explorers disastrous first encounter with Mississippi River flooding, and were ultimately killed by its waters--as they attempted to flee in crafts defending tribes had set afire. 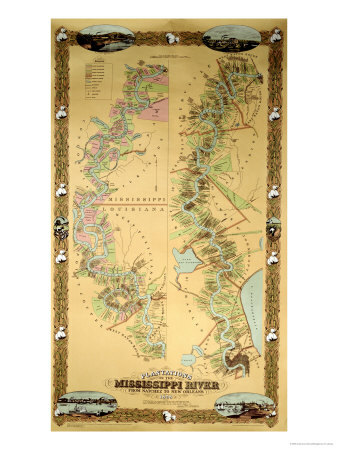 Eventually more European explorers and colonists began to travel the Mississippi, though, recognizing its value. The entire river was claimed by France at one point, then parts were briefly passed on to the Spanish before lower river was handed over to the Americans as part of the Louisiana Purchase. Americans pushed into the Mississippi River area in numbers, building homes, towns, cities and using the waterways as a means to connect it all. The first steamboat, the New Orleans, sailed the river in 1811, thus setting the stage for one of the most historic and romantic periods of the Mississippi River history. Though intrepid souls will still take a canoe to the smaller tributaries of the Mississippi, even today a riverboat ride is, to some, a ride through history. One man does not make a river, but the writer Mark Twain is probably more associated with the Mississippi River, its stories, legends and history, than any other person. People, readers of Twain's books and those who simply know the stories, feel that they know the river and have a connection to it, just from his telling of tales. Huck Finn and Tom Sawyer and their adventures on and around the river have entertained many a generation. The riverboats, too, with their paddles and steam engines capture the imagination of people. The mildest-mannered people might imagine themselves as riverboat gamblers, wharf rats and others who make their living--and dying, at least in the stories--along the mighty river. The long expanse of the river makes it similar to a city all on its own. The people on the river--the ones that live and breathe the river, know its sounds and its moods, and can tell when something is going to happen on it just by sight or smell--these speak their own language, and share a connection, even if they are far apart. Fortunes have been made on the river, through shipping and recreation, and they have been lost as quickly. Shameful incidents are sometimes buried, but more often yet another story is created around them--sometimes cautionary, sometimes just a little naughtily triumphant. The Mississippi River may not be your first thought when you think of a place for mermaids--but that's only because you've probably not heard the stories. Like that of the Pascagoula tribe who, seeking an escape from the Europeans, saw a mermaid rise from the river, singing a beautiful song. The entire tribe followed the mermaid's song into the river, drowning--yet, it is said, they sing her praises from the bottom of the river to this day. Ghosts, however, go with the Mississippi like ice cream and pie. They seem particularly fond of river mansions, hiding in attics, walking the halls and, of course, gracefully posing under leaf-laden trees. You can't walk far along the river without encountering a ghost--or at least their story. They usually hang about after a botched love affair, an unusual death or to revenge themselves on a hated place long after they've died. The ghosts, and stories, vary by region, culture and what messages or lessons they are needed to impart. Most tend to be Native American, European American and African American, to go along with the majority of the people of the Mississippi River region. If you're traveling the river, staying in the homes and inns of the area, and you come across doors that lock themselves, beds that scoot, and walls that knock--well, then you'll have your own Mississippi River story to tell. Water has a lot more power than we often realize. Interesting. I see much useful information here. 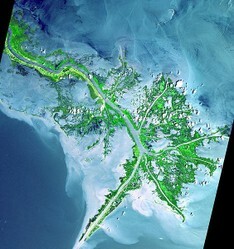 Going even farther back, the Mississippi has changed course, causing much of Louisiana to be flat. I heard it started at the now Texas border in the Sabine River channel, and carved everything as it moved east over the many years. A fascinating article about one of the greatest rivers! I enjoyed its history and the interesting facts you provided. @Jimmie that is really interesting information. Thanks for adding it to this article. @Tolovaj The Mississippi River has had a very big influence on American literature and culture. @Jo It is interesting that you would recite a rhyme about an American river, however, the spelling makes it fun to recite. We always remember the spelling by saying, "MIss Iss IppI" with the emphasis on the capital I's. Interesting how associations work. I saw title with a word Mississippi and at the very moment thought about Mark Twain. And you mentioned Mark Twain as a man who's stories are greatly connected with the river... I also remember a trick question from old show. How many letters S are in the longest river in the world? Here in Memphis, you can walk on a model of the Mississippi River at Mud Island. There is also a museum devoted to the river. The muddy Mississip (as we call it here) evokes thoughts of "home" to me! I was only talking about the Mississippi River last night! Someone was asking me about the death penalty (I'm your Go-To-Person for all kinds of unsavory facts and figures unfortunately...). A doctor on a boat there witnessed a man killed outright by staggering drunk into an electrical generator. The doctor then got the idea for the electric chair, as a 'humane' way of execution. I have no idea why. For a start, it doesn't actually spell it correctly; and secondly, this was a BRITISH school! I haven't thought on that in years. 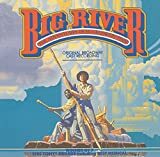 "Ol' Man River, he must know something..."